Latest version of Whatsapp now allows users to Mention group participants using the "@" feature. This is one of the features we've been waiting for. 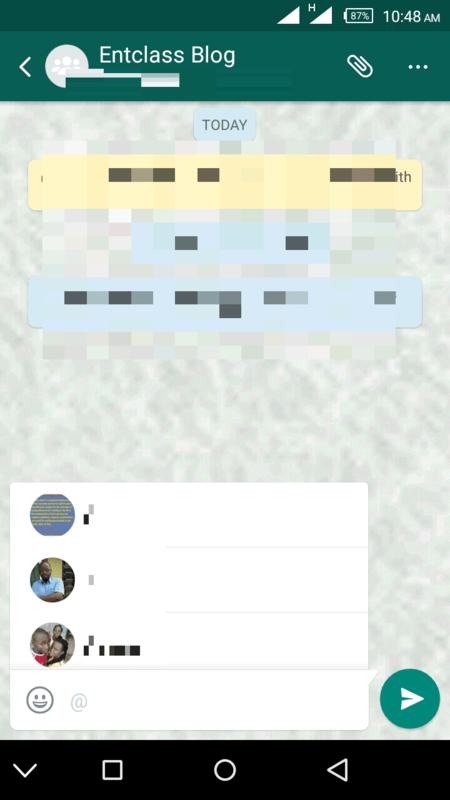 If you recall, Whatsapp recently added the ability to quote message in chat but this feature looks exactly like this new Mention feature with a little design. Once you are being Mentioned, you will automatically be notified even if you are offline. Today, i will teach you how to use this feature and where to download the latest version of Whatsapp. NOTE: This feature only works in Whatsapp group chat. When you're in a group chat, try typing the symbol @ and you'll get a list of all the participants in that group. You can tap any of them or just type the first letter of anyone's name and it'll list out the participants. Select them and the name will show up as hyperlinked (blue) in the text entry box. Once you send the text, the hyperlink will still be there in the sent message. Anyone can tap the hyperlinked name to get to the specific contact's page details. WHERE CAN I DOWNLOAD THE LATEST VERSION OF WHATSAPP? This feature is now live in the latest version of WhatsApp v2.16.274 on Google playstore. Head on to Google playstore & update your Whatsapp. This is really nice though but we are still anticipating the release of Video chat feature on Whatsapp. admin please add me to your WhatsApp group.